Jack: Mommy, is it tomorrow yet? Me: No, it’s not tomorrow yet. Actually it’s never tomorrow. Jack: Then what day is it? Me: Today is Sunday. It’s always today. Jack: When is it going to be tomorrow? Me: Why do you want it to be tomorrow? Jack: Because I want to eat my cookie and you said I could eat it tomorrow. Me: Oh, okay, yes it is tomorrow. Let’s go eat your cookie. Today I sent out an email to Pat at work. As soon as I hit the sent button, I got a bad feeling. I was pretty sure I didn’t hit Reply All. But something didn’t quite feel right about it. Sure enough, as I checked the outgoing message log, I realized that I sent it to a lady at Defense Finance & Accounting Service. Only this went to the lovely lady who is trying to fix all these problems. I quickly sent her another email and apologized for my previous email, told her I was sure she knew what she was doing, and apologized again. She wrote back to me and was actually really nice about it and that made me feel even worse. I hadn’t heard from Pat about this until he was on his way home. He told me that he had to spend an extra hour at work because the Executive Officer called him into his office about some email I had sent. I was mortified even more until he finally told me that he was kidding and just wanted to mess with me. He’s been looking at me and laughing at me and telling this story all night. Ha ha. Maybe I subconsciously sent this email so I would have something to blog about tonight. Casey seems to go from adorable and sweet one minute to unbearable the next. (Also known as terrible twos I think.) And Jack is testing the limits of everything. Actually, Pat thinks the story gets even better when he came home because both kids were running around naked while I was making dinner. We had just come in from puddle jumping and their clothes were wet. Then they got new stickers in the mail from Nana so they decided to stick the stickers all over themselves. Whatever keeps them busy while I make dinner! Today I kind of felt like I was a visitor in my own home, kind of wondering who these kids were and why they were doing anything that they did. It was a pretty humorous but long day. Pat is on a business trip for the week, Casey’s had a runny nose that has kept us away from the gym and it was a chilly, windy day so I had no desire to spend any time outside. The morning started with some discussion of being a good citizen that I was trying to have with Jack. His teacher is talking about it in preschool and he had some homework about being a good citizen. He wasn’t interested in talking about or thinking about being a good citizen this morning. I probably should have been talking about it at various points during the weekend but for some reason I tend to procrastinate on preschool homework. We (I) printed out some recycling pictures and we talked about it a little bit but he was more interested in cutting his paper into small pieces. Maybe that was his first step towards recycling that paper into new paper. When we went upstairs to get dressed, Jack & Casey had no interest in clean clothes for the new day. Instead, they dragged all of their blankets and pillows into my bedroom to make new beds for themselves. Then Casey placed hers in the dog crate and asked me to shut the door for her. She just laid there until I finally had to drag her out so we could get dressed and out the door. Casey used her shopping cart for shoe shopping today and put all the shoes she could find into it. Then she stopped like she was waiting to cross a street and said, “Turkey’s coming!” I told her the turkey was done and she carried on with pushing a cart of shoes around the house. In the meantime, Jack was playing with his pet dog Rory. He told me that Rory was pulling him around the house and yanking him around a little bit. 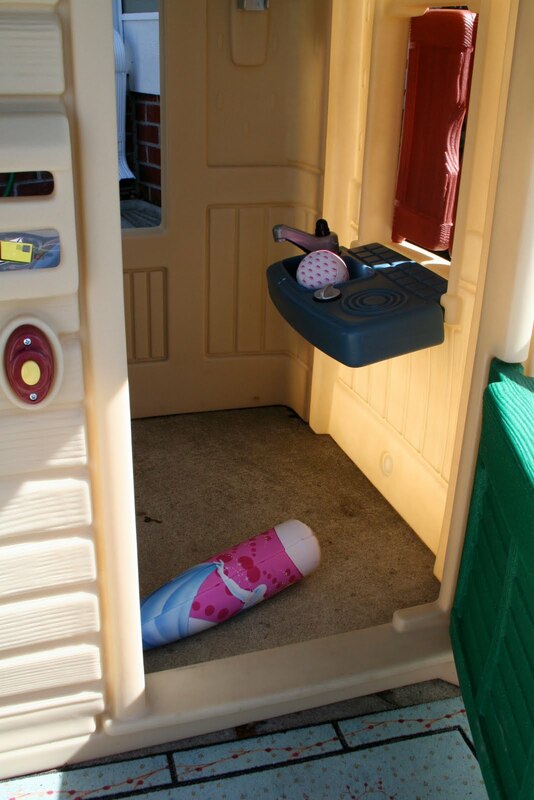 He tied Rory up to the toy kitchen so he wouldn’t pull anymore. Sounds a lot like a dog named Tugger. A lot of times, Casey asks to go take a nap when she is tired. Today, she thought it would be more fun to throw all of her blankets and animals out of her crib and then cry. About an hour later she was crying hysterically and yelling for something. All her blankets were still in the bed…but she was BUCK NAKED and yelling, “I want my monkey shirt!” Monkey shirt, pants and diaper were on the floor. At least she didn’t wet the bed during the time her clothes were off. She saved that for later on the carpet. During Jack’s quiet time he asked if he could tell me some stories. He told me about a tiger who lived in Chuckle Hottage. Not to be confused with Chuckle Cottage where Little Miss Giggles lives. He also told me about a baby giraffe who was in the river and went down a waterfall. Between dinner and bathtime, Casey broke a mirror, but Jack managed to find his purple ball. He drove Pat and I crazy on Sunday asking us where his ball was. We didn’t know and we told him repeatedly that we didn’t know where it was, but that didn’t seem to stop him from asking again. Now he’s happy that he found it. And I’m happy that everyone is in bed and the day is done! Yesterday was a beautiful spring day. Although it seems to me that Virginia generally skips spring and moves right into summer…at least what summer feels like in Maine. Yesterday would have been a beautiful summer day in Maine but we had it here in March. We spent the afternoon outdoors. Jack didn’t nap and Casey took a short one, so we had plenty of time to play with every toy. Halfway through the afternoon, I thought I would document the day with some pictures, but since I thought of it so late, I only have a few to show. I thought I might sit in this chair and read a magazine, take some pictures and field important calls. As soon as I got it out, I’m pretty sure I was needed to pitch or catch or bat or go for a walk or play volleyball with a beach ball or get Casey her cell phone. 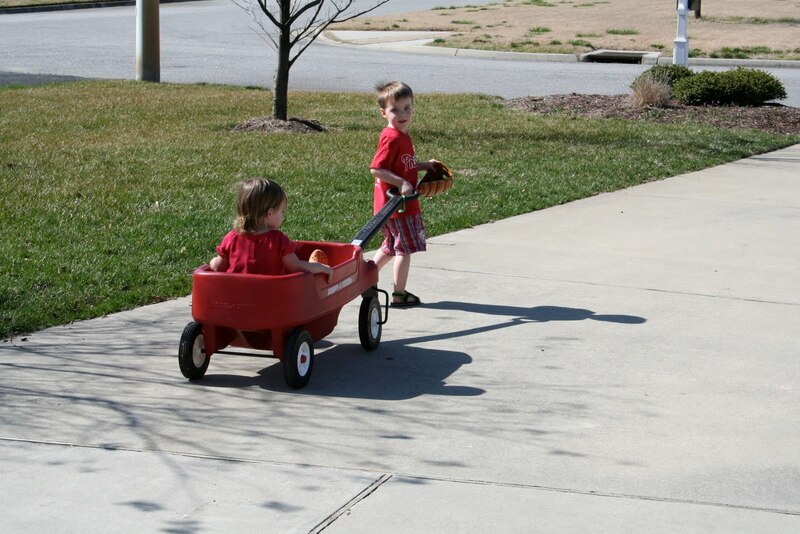 We got the wagon out for her inaugural ride of 2010 and went for a cruise around the neighborhood. Casey brought her cell phone with her and “chatted” to somebody the whole way. When we got back, Casey asked to ride some more, so Jack took her up and down the driveway a little bit. Jack and I played a lot of baseball with his new bat and ball from Nana. We searched around the garage and found my softball glove so that we would both have gloves. I don’t think I have ever felt like such a good baseball/softball player as I do when I play with Jack. I can hit almost any pitch he throws to me. It’s like back in 8th grade when I was the MVP of the Alexander Elementary School softball team. Actually, I still don’t know how I earned that accolade. I really wasn’t much of a slugger, weighing in at probably 70 lbs. And I’m not sure my glove was all that golden either. Hmmm. Here’s to more days of fun and sun in the driveway! Every time I asked Casey what she wanted to read over the last few weeks, she would say “Dora.” And we had no Dora books. We checked one out of the library a few months ago but had to return it. So, we went to Barnes & Noble and Casey got her Dora book. It’s actually two stories in one. In the first part, Dora and her friends make a wish to “Little Star.” Dora wishes for sunshine, Boots the monkey wishes for bananas and the iguana wishes for flowers. Not my first guess if someone asked me what an iguana wishes. Then, Dora asks you, the reader, what your wish is. And three times in a row, Jack has said, “I wish for a boat to run into a sand bar.” I have no idea where he came up with that. I’m not sure if Caillou had a rough boating day on one of his episodes or maybe Dora herself needed a “chart” instead of a “map” one day to help her navigate some treacherous waters. But Jack thinks he’s pretty funny when he says it. I continue to look at him and wonder how that little brain works. I finished the first of what I hope is many crafty projects today. I think I started this project about 4 weeks ago when I ran out to Hancock Fabric on a Sunday afternoon to buy some fabric to cover some pillows. The pillows I planned to cover were red and I switched to a blue with white polka dot. Hancock Fabric closes at 5pm on Sundays which I learned as I pondering different colors and a store manager announced that the store was now closed. The blue with polka dots was in front of me at the time and that’s what I went with. This couch doesn’t get used much, except by the dog, so I wanted to make a cover for these red pillows that I could just throw in the wash when I needed to eliminate some dog slobber. I used a simple tutorial from a blog called Make It and Love It. The hardest part of this project was cutting out the material. I didn’t have all the right supplies to make sure that I had straight lines and square corners. I thought if I just used the polka dots as a guide that everything would come out alright. This was not true, as one came out a little skewed. Because I was a little dejected by this, it took about three weeks of the fabric just sitting on my dining room table before I finally sewed them. The second hardest part of the project was digging the sewing machine out of the closet and actually bringing it all the way down the stairs and taking it out of the box. After that, it was a sewing breeze. It’s not the most dramatic transformation ever, but it gives the couch and the room a fresh look and brings out the blue in the Annapolis picture above the couch.